Ever since the Curiosity rover landed on Mars in 2012, it has provided NASA scientists with invaluable data about the planet’s past, as well as some breathtaking images of the planet’s surface. Much like its predecessors, the Spirit and Opportunity rover, many of these images have shown what it is like to look up at the sky from the surface of Mars and witness celestial events. Of these events, one of the most intriguing has to be the many Martian solar eclipses that have taken place since the rover’s landed. Last month, the Curiosity rover witnessed two eclipses as the moons of Phobos and Deimos both passed in front of the Sun. These latest eclipses will allow scientists to fine-tune their predictions about Mars’ satellites and how they orbit the Red Planet. Holy moly, that was awesome! Incredible, fantastic, amazing…there just aren’t the words to describe what it is like to experience totality. While I’m trying to come down to Earth and figure out how to explain how wonderful this was, enjoy the beautiful images captured by our readers from across the US and those from across the world who traveled to capture one of nature’s most spectacular events: a total solar eclipse. The images from those seeing partial eclipses are wonderful, as well, and we’ll keep adding them as they come in (update, we just got some from Europe too). Great job everyone! Eclipse panorama. Got some cool Baily’s Beads and that prominence is nuts! Shot at 2000mm on an old Celestron 8in telescope! Credit and copyright: Kenneth Brandon. 2017 Solar Eclipse from Clayton GA, USA. Celestron C8 Telescope on CGEM. Canon T3i (Modified IR enhanced), Solar Filter. Credit and copyright: Michael Bee. The August 21, 2017 total solar eclipse over the Grand Tetons as seen from the Teton Valley in Idaho, near Driggs. ..This is from a 700-frame time-lapse and is of second contact just as the diamond ring is ending and the dark shadow of the Moon is approaching from the west at right, darkening the sky at right, and beginning to touch the Sun. The peaks of the Tetons are not yet in the umbral shadow and are still lit by the partially eclipsed Sun. ..With the Canon 6D and 14mm SP Rokinon lens at f/2.5 for 1/10 second at ISO 100. Credit and copyright: Alan Dyer. Total Solar Eclipse, August 21, 2017 as seen from Tellico Plains, Tennessee. New City Expedition, photo by Igor Kuskovsky. Partial Eclipse montage from Charlottesville, Virginia. Credit and copyright: David Murr. Partial Solar Eclipse August 21st 2017, as seen from Fullerton California USA. Sky: Partially Cloudy. Telescope: Nexstar 102 SLT Refractor, Camera: Fujifilm X-T1 @ Prime Focus. Credit and copyright: Jimmy CD. From the total solar eclipse as seen in Columbia, Missouri, on Aug. 21, 2017. Credit and copyright: Wildhaven Creative. Total Eclipse from Shaw Air Force Base (August 21, 2017). It was magical. Credit and copyright: Michael Seeley. Partial solar eclipse, seen from the west coast of France, August 21, 2017. Credit and copyright: Frank Tyrlik. Great American Eclipse, 21-08-2017. Silver Falls Oregon 10:17-10:19 local time. Raw straight out of the camera. 65mm Refractor / Canon 700D. Credit and copyright: Alexandra Hart. “Eclipse Across America:” Could This Event Bring Us All Together? The four-part series takes an inside preview at this highly anticipated event. NASA experts, an international group of astronomers and seasoned eclipse chasers reveal secret viewing spots and tips on how to safely view what could be for millions of people a once-in-a-lifetime opportunity to see one of the most spectacular sights in nature: a total solar eclipse. Our friend and Astronomy Cast co-host Dr. Pamela Gay, who is also the Director of Technology at the Astronomical Society of the Pacific, is part of the all-star “astronomy cast” (pun intended) of experts, and she talked with us about her part in the show. A special effects image from CuriosityStream showing how the solar eclipse could look in St. Louis, Missouri. Credit: CuriosityStream. The really fun part of this particular eclipse is that it takes a path across the entire continental U.S. I asked Pamela if, given the rather divisive political and social climate these days in this country, could this total solar eclipse become a possible unifying moment? If you already have a CuriosityStream account, you can watch the series starting with Episode One here. If you don’t, you can take advantage of a 7-day free trial in order to watch this series, and all the other great science offerings available, such as Stephen Hawking’s Universe, Brian Cox’s Wonders of Life, and other topics from astronomy observing tips to info about various missions to theoretical physics. Check it out. If you’re interested in continuing after your free trial, the ad-free streaming service costs $2.99, $5.99 and $11.99 per month for standard definition, high definition, and ultra high definition 4K respectively. NASA has turned a lot of heads in recent years thanks to its New Worlds Mission concept – aka. Starshade. Consisting of a giant flower-shaped occulter, this proposed spacecraft is intended to be deployed alongside a space telescope (most likely the James Webb Space Telescope). It will then block the glare of distant stars, creating an artificial eclipse to make it easier to detect and study planets orbiting them. The only problem is, this concept is expected to cost a pretty penny – an estimated $750 million to $3 billion at this point! Hence why Stanford Professor Simone D’Amico (with the help of exoplanet expert Bruce Macintosh) is proposing a scaled down version of the concept to demonstrate its effectiveness. Known as mDot, this occulter will do the same job, but at a fraction of the cost. The purpose behind an occulter is simple. When hunting for exoplanets, astronomers are forced to rely predominantly on indirected methods – the most common being the Transit Method. This involves monitoring stars for dips in luminosity, which are attributed to planets passing between them and the observer. By measuring the rate and the frequency of these dips, astronomers are able to determine the sizes of exoplanets and their orbital periods. However, this method also suffers from a substantial rate of false positives and generally requires that part of the planet’s orbit intersect a line-of-sight between the host star and Earth. Studying the exoplanets themselves is also quite difficult, since the light coming from the star is likely to be several billion times brighter than the light being reflected off the planet. The ability to study this reflected light is of particular interest, since it would yield valuable data about the exoplanets’ atmospheres. As such, several key technologies are being developed to block out the interfering light of stars. A spacecraft equipped with an occulter is one such technology. Paired with a space telescope, this spacecraft would create an artificial eclipse in front of the star so objects around it (i.e. exoplanets) can be clearly seen. But in addition to the significant cost of building one, there is also the issue of size and deployment. For such a mission to work, the occulter itself would need to be about the size of a baseball diamond – 27.5 meters (90 feet) in diameter. It would also need to be separated from the telescope by a distance equal to multiple Earth diameters and would have to be deployed beyond Earth’s orbit. All of this adds up to a rather pricey mission! As such, D’Amico – an assistant professor and the head of the Space Rendezvous Laboratory (SRL) at Stanford – and and Bruce Macintosh (a Stanford professor of physics) teamed up to create a smaller version called the Miniaturized Distributed Occulter/Telescope (mDOT). The primary purpose of mDOT is to provide a low-cost flight demonstration of the technology, in the hopes of increasing confidence in a full-scale mission. Consisting of two parts, the mDOT system takes advantage of recent developments in miniaturization and small satellite (smallsat) technology. The first is a 100-kg microsatellite that is equipped with a 3-meter diameter starshade. The second is a 10-kg nanosatellite that carries a telescope measuring 10 cm (3.937 in) in diameter. Both components will be deployed in high Earth orbit with a nominal separation of less than 1,000 kilometers (621 mi). With the help of colleagues from the SRL, the shape of mDOT’s starshade was reformulated to fit the constraints of a much smaller spacecraft. As Koenig explained, this scaled down and specially-designed starshade will be able to do the same job as the large-scale, flower-shaped version – and on a budget! However, since the shadow created by mDOT’s starshade is only tens of centimeters in diameter, the nanosatellite will have do some careful maneuvering to stay within it. For this purpose, D’Amico and the SRL also designed an autonomous system for the nanosatellite, which would allow it to conduct formation maneuvers with the starshade, break formation when needed, and rendezvous with it again later. An unfortunate limitation to the technology is the fact that it won’t be able to resolve Earth-like planets. Especially where M-type (red dwarf) stars are concerned, these planets are likely to orbit too close to their parent stars to be observed clearly. However, it will be able to resolve Jupiter-sized gas giants and help characterize exozodiacal dust concentrations around nearby stars – both of which are priorities for NASA. In the meantime, D’Amico and his colleagues will be using the Testbed for Rendezvous and Optical Navigation (TRON) to test their mDOT concept. This facility was specially-built by D’Amico to replicate the types of complex and unique illumination conditions that are encountered by sensors in space. In the coming years, he and his team will be working to ensure that the system works before creating an eventual prototype. Other projects that D’Amico and the SNL are currently engaged in include developing larger formations of tiny spacecraft (aka. “swarm satellites”). In the past, D’Amico has also collaborated with NASA on such projects as GRACE – a mission that mapped variations in Earth’s gravity field as part of the NASA Earth System Science Pathfinder (ESSP) program – and TanDEM-X, an SEA-sponsored mission which yielded 3D maps of Earth. These and other projects which seek to leverage miniaturization for the sake of space exploration promise a new era of lower costs and greater accessibility. With applications ranging from swarms of tiny research and communications satellites to nanocraft capable of making the journey to Alpha Centauri at relativistic speeds (Breakthrough Starshot), the future of space looks pretty promising! In a classic swords-to-plowshares move, two converted WB-57F aircraft flown by NASA’s Airborne Science Program will greet the shadow of the Moon as it rushes across the contiguous United States on Monday, August 21st on a daring mission of science. Total solar eclipses provide researchers with a unique opportunity to study the solar corona – the ghostly glow of the Sun’s outer atmosphere seen only during totality. NASA plans a battery of experiments during the eclipse, including plans to intercept the Moon’s shadow using two aircraft near the point of greatest totality over Carbondale, Illinois. Flying out of Ellington Field near Houston Texas and operated by NASA’s Johnson Spaceflight Center, NASA is the only remaining operator of the WB-57F aircraft. Flying at an altitude of 50,000 feet, the aircraft will intercept the 70 mile wide shadow of the Moon. The shadow will be moving at 1,400 miles per hour – twice the speed of sound – versus the WB-57F aircraft’s max speed of 470 miles per hour. The flight will extend the length of totality from the 2 minutes 40 seconds seen on the ground, to a total of about 8 minutes between the two aircraft. The two converted WB-57F Canberra tactical bombers will track the eclipse using DyNAMITE (Day Night Airbourne Motion Imagery for Terrestrial Environments), two tandem gimbal-mounted 8.7-inch imagers, one for visible light and one for infrared. These are located in the nose of the aircraft and will shoot 30 frames per second. This system was originally designed about a decade ago to chase down the U.S. Space Shuttle during reentry following the 2003 Columbia disaster and has, on occasion, provided amazing footage SpaceX Falcon-9 Stage 1 returns during reentry. The solar corona is about as bright as the Full Moon, and the team plans to make a precise ‘map’ of the solar corona in an effort to understand just how the corona interacts with the solar photosphere and the chromosphere. Of particular interest is understanding how wave energy and ‘nanoflares’ heat the solar corona. As a secondary objective, the team will also make observations of the planet Mercury in the infrared 30 minutes before and after totality, located 11 degrees to the east of the Sun during the eclipse. Mercury never strays far from the Sun, making it a tough target to study in the infrared as seen from the Earth. Totality! Credit: Alan Dyer/Amazing Sky Photography. And of course, all of this has to happen during the scant few minutes up to and during totality. Each aircraft will fly just inside opposite ends of the shadow of the Moon in a challenging long distance precision formation. The WB-57F aircraft will also participate in a tertiary objective, hunting for Vulcanoid asteroids near the Sun during the eclipse. Though the 19th century idea of a tiny inter-Mercurial world perturbing Mercury’s orbit was banished to the dust bin of astronomical history by Einstein’s general theory of relativity, there’s still room for undiscovered asteroids dubbed ‘Vulcanoids’ close in to the Sun. NASA flew observations hunting for Vulcanoids aboard modified F-18 Hornet aircraft in 2002 scanning twilight realms near the Sun, and came up with naught. Eclipse chaser Landon Curt Noll noted during an interview with Universe Today in 2015 that NASA’s Solar Heliospheric Observatory SOHO mission has pretty much ruled out objects brighter than +8th magnitude near the Sun, which translates into asteroids 60 kilometers in diameter or larger. “We have searched down to magnitude +13.5,” Noll told Universe Today. “Assuming the objects are ‘Mercury like’ in reflectivity (in) the Vulcanoid zone (0.08 to 0.18 AU from the Sun), the search has looked for and failed to find objects as small as 2 to 6 kilometers in diameter.” NASA’s Mercury Messenger carried out a similar search en route to the innermost planet. Mercury versus the Sun during totality. Credit: Stellarium. Knoll has scoured the sky near the eclipsed Sun with a specialized near-infrared telescope rig during the 2006 total solar eclipse over Libya. Next month, he plans to continue his quest from a site near Jackson Hole, Wyoming. The action leading up to the the long awaited August 21st total solar eclipse begins at 17:16 Universal Time (UT)/ 10:16 AM Pacific Daylight Saving Time (PDT), when the Moon’s dark inner shadow or umbra touches down along the Oregon Pacific coast. From there, the 70 mile wide shadow will race eastward, gracing 14 states (just nicking Iowa and Montana) before departing land over the Atlantic coast of South Carolina 92 minutes later. Viewers along the path will witness a maximum totality of 2 minutes and 40 seconds, centered on a location very near Carbondale, Illinois. Millions are expected to make the pilgrimage to the eclipse path, while those outside the path in the remainder of North America as well as northern South America, western Africa, Europe and northeast Asia will see varying levels of a partial solar eclipse. This is the end of a long “total solar eclipse drought” for the United States, marking the first time totality touched the continental United States since February 26, 1979, (totality crossed Hawaii on July 11th, 1991). The last total solar eclipse to cross the United States from coast-to-coast was June 8th, 1918. NASA has a long history of airborne astronomy campaigns. Noll notes that NASA’s Stratospheric Observatory for Infrared Astronomy (SOFIA) flying observatory based out of Armstrong research center would make an ideal platform for Vulcanoid hunting during totality. Looking at SOFIA’s flight schedule, however, reveals no plans to carry out such a chase on August 21st. SOFIA’s predecessor, the Kuiper Observatory built into a U.S. Air Force C-141 Starlifter discovered the rings of Uranus during a stellar occultation in 1977. The DyNAMITE/WB-57B campaign will also be part of the live NASA TV webcast on eclipse day. Today, you can even book a ticket for an eclipse-chasing experience aloft. Alaska Airlines plans to attempt to duplicate its 2016 success, and will once again chase totality with a lucky few observers aboard next month. As for us, we’re planning on watching the eclipse from terra firma at the Pisgah Astronomical Research Institute (PARI) in North Carolina while intrepid researchers fly high above. Watch for our complete eclipse guide out around July 21st on Universe Today and an update on weather prospects, solar activity etc. about a week prior. Finally, we’ll have an after action report out post total solar eclipse, with reader images from across the country. -This promises to be a total solar eclipse for the ages. Don’t miss the Great American Eclipse! -Also, be sure to check out the Eclipse MegaMovie Project. -Read more about the August 21st total solar eclipse and the true tale of Vulcan, Totality and Edison’s Chickens in our free e-guide to 101 Astronomical Events for 2017, out from Universe Today. -Be sure to read our original tales of eclipse science fiction. Mike Simmons is the President of Astronomer Without Borders. Mike is joining us today to discuss how AWB will be engaging the public and our schools both during and following the total solar eclipse on August 21, 2017. You can find the AWB Eclipse education program website here. If you’d like to purchase eclipse glasses from AWB, all of the proceeds go to science education programs! Order here! We use a tool called Trello to submit and vote on stories we would like to see covered each week, and then Fraser will be selecting the stories from there. Here is the link to the Trello WSH page (http://bit.ly/WSHVote), which you can see without logging in. If you’d like to vote, just create a login and help us decide what to cover! The WSH recently welcomed back Mathew Anderson, author of “Our Cosmic Story,” to the show to discuss his recent update. He was kind enough to offer our viewers free electronic copies of his complete book as well as his standalone update. Complete information about how to get your copies will be available on the WSH webpage – just visit http://www.wsh-crew.net/cosmicstory for all the details. On Monday, August 21, 2017, there’s going to be a total eclipse of the Sun, visible to path that goes right through the middle of the United States. You should be making plans to see this, and we’re here to help you know where to go and what to do. We usually record Astronomy Cast as a live Google+ Hangout on Air every Friday at 1:30 pm Pacific / 4:30 pm Eastern. You can watch here on Universe Today or from the Astronomy Cast Google+ page. Tim Blais is the founder of A Capella Science, an “educational and utterly nerdy online video project.” You can find his videos online on YouTube at A Capella Science. On Friday, May 12, the WSH will welcome authors Michael Summers and James Trefil to the show to discuss their new book, Exoplanets: Diamond Worlds, Super Earths, Pulsar Planets and the New Search for Life Beyond Our Solar System. In anticipation of their appearance, the WSH Crew is pleased to offer our viewers a chance to win one of two hard cover copies of Exoplanets. Two winners will be drawn live by @fraser during our show on May 12th. To enter for a chance to win a copy of Exoplanets, send an email to: [email protected] with the Subject: Exoplanets. Be sure to include your name and email address in the body of your message so that we can contact the winners afterward. All entries must be electronically postmarked by 23:59 EST on May 10, 2017, in order to be eligible. No purchase necessary. Two winners will be selected at random from all eligible entries. Good luck! If you’d like to join Fraser and Paul Matt Sutter on their Tour to Iceland in February 2018, you can find the information at astrotouring.com. Not many people get excited about a penumbral eclipse, but when it’s a deep one and the only lunar eclipse visible in North America this year, it’s worth a closer look. What’s more, this Friday’s eclipse happens during convenient, early-evening viewing hours. No getting up in the raw hours before dawn. During a partial or total lunar eclipse, the full moon passes first through the Earth’s outer shadow, called the penumbra, before entering the dark, interior shadow or umbra. The penumbra is nowhere near as dark as the inner shadow because varying amounts of direct sunlight filter into it, diluting its duskiness. To better understand this, picture yourself watching the eclipse from the center of the Moon’s disk (latitude 0°, longitude 0°). As you look past the Earth toward the Sun, you would see the Sun gradually covered or eclipsed by the Earth. Less sunlight would be available to illuminate the Moon, so your friends back on Earth would notice a gradual dimming of the Moon, very subtle at first but becoming more noticeable as the eclipse progressed. As the Moon’s leading edge approached the penumbra-umbra border, the Sun would narrow to a glaring sliver along Earth’s limb for our lucky lunar observer. Back on Earth, we’d notice that the part of the Moon closest to the umbra looked strangely gray and dusky, but the entire lunar disk would still be plainly visible. That’s what we’ll see during Friday’s eclipse. The Moon will slide right up to the umbra and then roll by, never dipping its toes in its dark waters. During a partial eclipse, the Moon keeps going into the umbra, where the Sun is completely blocked from view save for dash of red light refracted by the Earth’s atmosphere into what would otherwise be an inky black shadow. This eclipse, the Moon only flirts with the umbra. Because the moon’s orbit is tilted about 5° from the plane of Earth’s orbit, it rarely lines up for a perfect bullseye total eclipse: Sun – Earth – Moon in a straight line in that order. Instead, the moon typically passes a little above or below (north or south) of the small, circle-shaped shadow cast by our planet, and no eclipse occurs. Or it clips the outer edge of the shadow and we see — you guessed it — a penumbral eclipse. Earth’s shadow varies in size depending where you are in it. Standing on the ground during twilight, it can grow to cover the entire sky, but at the moon’s distance of 239,000 miles, the combined penumbra and umbra span just 2.5° of sky or about the width of your thumb held at arm’s length. Because the Moon travels right up to the umbra during Friday’s eclipse, it will be well worth watching.The lower left or eastern half of the moon will appear obviously gray and blunted especially around maximum eclipse as it rises in the eastern sky that Friday evening over North and South America. I should mention here that the event is also visible from Europe, Africa, S. America and much of Asia. You can see that the eclipse plays out over more than 4 hours, though I don’t expect most of us will either be able or would want to devote that much time. Instead, give it an hour or so when the Moon is maximally in shadow from 6 to 7:30 p.m. CST; 7-8:30 EST; 5-6:30 p.m. MST and around moonrise Pacific time. This should be a fine and obvious eclipse because around the time of maximum, the darkest part of the penumbra shades the dark, mare-rich northern hemisphere of the Moon. Dark plus dark equals extra dark! Good luck and clear skies! What is a Total Eclipse? Imagine if you will, that you are a human being living in prehistoric times. You look up at the sky and see the Sun slowly being blocked out, becoming a ominous black sphere that glows around the edges. Could you really be faulted for thinking that this was some sort of supernatural event, or that the end of the world was nigh? Of course not. Which is why for thousands of years, human beings believed that solar eclipses were just that – a sign of death or a bad omen. But in fact, an eclipse is merely what happens when one stellar object passes in front of another and obscures it. 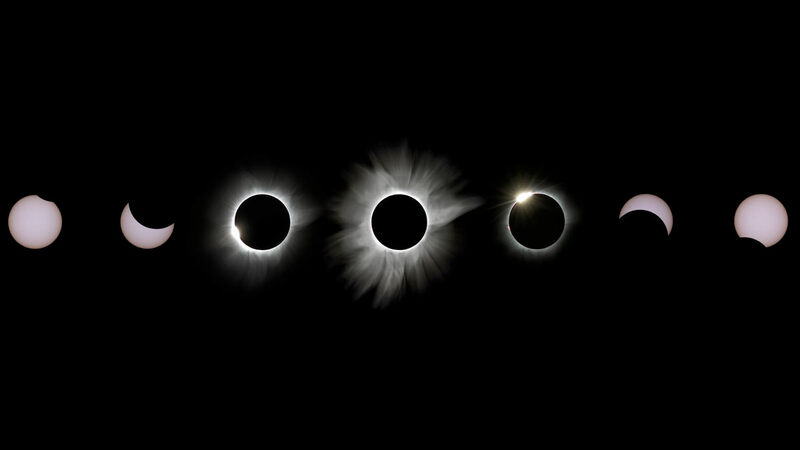 In astronomy, this happens all the time; and between the Sun, the Moon, and the Earth, total eclipses have been witnessed countless times throughout history. The general term for when one body passes in front of another in a solar system is transit. This term accurately describes how, depending on your vantage point, stellar bodies pass in front of each other on a regular basis, thus causing the reflected light from that body to be temporarily obscured. However, when we are talking about how the Moon can pass between the Earth and the Sun, and how the Earth can pass between the Sun and the Moon, we use the term eclipse. This is also known as a syzygy, an astronomical term derived from ancient Greek (meaning “yoked together”) that describes a straight-line configuration between three celestial bodies. When the Moon passes between the Sun and the Earth, and the Moon fully occults (blocks) the Sun, it is known as the solar eclipse. The type of solar eclipse – total or partial – depends on the distance of the Moon from the Earth during the event. During an eclipse of the Sun, only a thin path on the surface of the Earth is actually able to experience a total eclipse – which is called the path of totality. People on either side of that path see a partial eclipse, where the Sun is only partly obscured by the Moon, relative to those who are standing in the center and witnessing the maximum point of eclipse. A total solar eclipse occurs when the Earth intersects the Moon’s umbra – i.e. the innermost and darkest part of its shadow. These are relatively brief events, generally lasting only a few minutes, and can only be viewed along a relatively narrow track (up to 250 km wide). The region where a partial eclipse can be observed is much larger. Totality! The view of the last total solar eclipse to cross a U.S. state (Hawaii) back in 1991. Credit and copyright: A. Nartist (shot from Cabo San Lucas, Baja California). During a solar eclipse, the Moon can sometimes perfectly cover the Sun because its size is nearly the same as the Sun’s when viewed from the Earth. This, of course, is an illusion brought on by the fact that the Moon is much closer to us than the Sun. And since it is closer, it can block the light from the Sun and cast a shadow on the surface of the Earth. If you’re standing within that shadow, the Sun and the Moon appear to line up perfectly, so that the Moon is completely darkened. After a solar eclipse reaches totality, the Moon will continue to move past the Sun, obscuring smaller and smaller portions of it and allowing more and more light to pass. A total eclipse of the Moon is a different story. In this situation, the entire Moon passes into the Earth’s shadow, darkening it fully. A partial lunar eclipse occurs when the shadow of the Earth doesn’t fully cover the Moon, so only part of the Moon is darkened. Unlike a solar eclipse, a lunar eclipse can be observed from nearly anywhere in an entire hemisphere. In other words, observers all across planet Earth can see this darkening and it appears the same to all. For this reason, total lunar eclipses are much more common and easier to observe from a given location. A lunar eclipse also lasts longer, taking several hours to complete, with totality itself usually averaging anywhere from about 30 minutes to over an hour. There are three types of lunar eclipses. There’s a penumbral eclipse, when the Moon crosses only the Earth’s penumbra (the region in which only a portion of light is obscured); followed by a partial, when the Moon crosses partially into the Earth’s umbra (where the light is completely blocked). Last, there is a total eclipse, when the Moon crosses entirely into the Earth’s umbra. A total lunar eclipse involves the Moon passing through all three phases, then gradually passing out of the Earth’s shadow and becoming bright again. Even during a total lunar eclipse, however, the Moon is not completely dark. Sunlight is still refracted through the Earth’s atmosphere and enters the umbra to provide faint illumination. Similar to what happens during a sunset, the atmosphere scatters shorter wavelength light, causing it to take on a red hue. This is where the phrase ‘Blood Moon‘ comes from. Since the Moon orbits the Earth, you would expect to see an eclipse of the Sun and the Moon once a lunar month. However, this does not happen simply because the Moon’s orbit isn’t lined up with the Sun. In fact, the Moon’s orbit is tilted by a few degrees – 1.543º between the angle of the ecliptic and the lunar equator, to be exact. This means that three objects only have the opportunity to line up and cause an eclipse a few times a year. It’s possible for a total of 7 solar and lunar eclipses every year, but that only happens a few times every century. The term eclipse is most often used to describe a conjunction between the Earth, Sun and Moon. However, it can also refer to such events beyond the Earth–Moon system. For example, a planet moving into the shadow of one of its moons, a moon passing into the shadow of its host planet, or a moon passing into the shadow of another moon. For instance, during the Apollo 12 mission in 1969, the crew was able to observe the Sun being eclipsed by the Earth. In 2006, during its mission to study Saturn, the Cassini spacecraft was able to capture the image above, which shows the gas giant transiting between the probe and the Sun. In July of 2015, when the New Horizons mission passed through the shadow of Pluto, it was able to capture a stunning image of the dwarf planet eclipsing the Sun. The image was taken at a distance of about 2 million km (1.25 million miles), which provided the necessary vantage point to see the disc of the Sun become fully obscured. On top of that, many other bodies in the Solar System can experience eclipses as well. These include the four gas giants, all of which have major moons that periodically transit between the planet and either Earth-based or space-based observatories. The most impressive and common of these involve Jupiter and its four largest moons (Io, Europa, Ganymede and Callisto). Given the size and low axial tilt of these moons, they often experience eclipses with Jupiter as a result of transits, relative to our instruments. An enviable view, of the most distant eclipse seen yet, as New Horizons flies through the shadow of Pluto. Credit: NASA/JPL. A well-known example occurred in April of 2014, when the Hubble Space Telescope caught an image of Ganymede passing in front at of Jupiter. 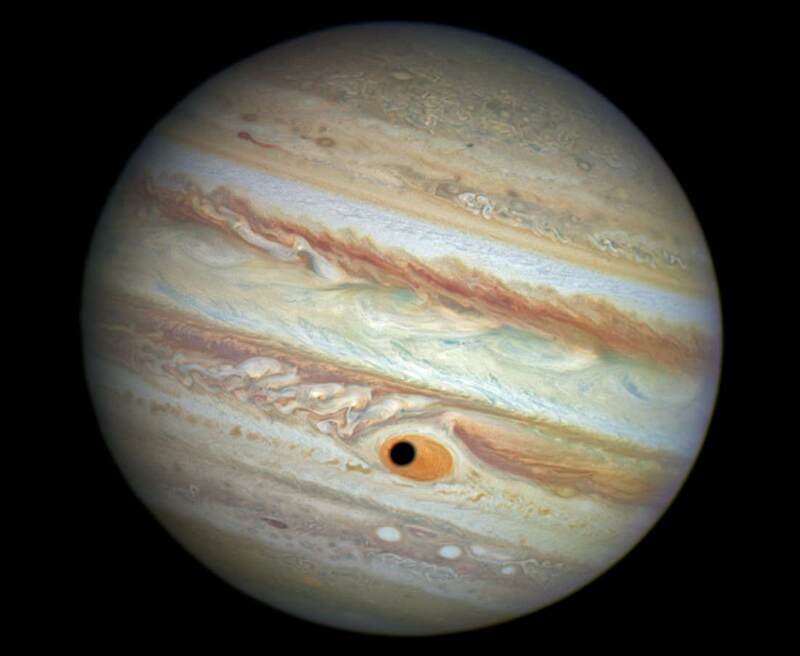 At the time the image was taken, Ganymede was casting its shadow within Jupiter’s Great Red Spot, which lent the planet a cyclops-like appearance (see below). The other three gas giants are known to experiences eclipses as well. However, these only occur at certain periods the planet’s orbit of the Sun, due to their higher inclination between the orbits of their moons and the orbital plane of the planets. For instance, Saturn’s largest moon Titan has been known to only occult the ringed gas giant once about every 15 years. Pluto has also been known to experience eclipses with is largest moon (and co-orbiting body) Charon. However, in all of these cases, the eclipses are never total, as they do not have the size to obscure the much larger gas giant. Instead, the passage of the moons in front of the larger celestial bodies either cast small shadows on the cloud tops of the gas giants, or lead to an annular eclipse at most. Similarly, on Mars, only partial solar eclipses are ever possible. This is because Phobos or Deimos are not large enough (or distant enough in their orbits) to cover the Sun’s disc, as seen from the surface of the planet. Phobos and Deimos have also been known to experience lunar eclipses as they slip into the shadow of Mars. Martian eclipses have been photographed numerous times from both the surface and from orbit. For example, in 2010, the Spirit rover captured images of a Martian lunar eclipse as Phobos, the larger of the two martian moons, was photographed while slipping into the shadow of Mars. Also, between Nov. 4 and Nov. 5, 2010, the Opportunity rover captured several images (later turned into movies) of a Martian sunset. In the course of imaging the Sun for a total of 17 minutes, Opportunity captured stills of the Sun experiencing a solar eclipse. And on September 13th, 2012 – during the 37th day of its mission (Sol 27) – the Curiosity rover captured an image of Phobos transiting the Sun. As far as astronomical events go, total eclipses (Lunar and Solar) are not uncommon occurrences. If you ever want to witness a one, all you need to do is keep track of when one will be visible from your part of the world. Some good resources for this are NASA’s Eclipse Website and timeanddate.com. Or, if you’re the really adventurous type, you can find out where on Earth the next path of totality is going to be, and then book a vacation to go there. Get to the right spot at the right time, and you should be getting the view of a lifetime! We have written many articles about the eclipse for Universe Today. Here’s a list of articles about specific times when a total Lunar Eclipse took place, and here’s a list of Solar Eclipse articles. And be sure to check out this article and video of an Annular Eclipse. If you’d like more info about the Eclipse, check out NASA Homepage, and here’s a link to NASA’s Solar System Simulator. We’ve also recorded related episodes of Astronomy Cast about Eclipses. Listen here, Episode 160: Eclipses. ESA – What is an Eclipse? Time and Date – What are Solar Eclipses?